This release adds support for high DPI screens and kRO:Zero, and fixes various UI glitches. This release adds support for /aura2, /btg, /cashshop, /goldpc, /roulette and /quake command presets. 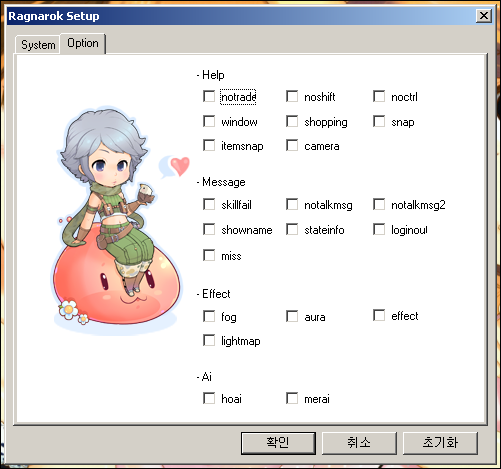 The OpenSetup interface language can now also be configured to use a specific language, rather than the system default. Fixes minor glitches on Windows 10. This maintenance release adds support for ASLR and DEP. No functional changes. This release adds French translation. No functional changes. This release adds Thai translation. No functional changes. This release adds Traditional Chinese translation. No functional changes. This release adds Simplified Chinese translation, updates Spanish translation and fixes various UI and debug log issues. Also updated public sources while being at it. This release improves Lua settings saving and adds an option to save in data\ rather than savedata\ as some older clients expect the settings there. This release updates Brazilian Portuguese translation. No functional changes. This release updates Japanese and Spanish translation. No functional changes. This release adds support for three ingame commands and improves compatibility and troubleshooting based on various user feedbacks. This release adds support for disabling hardware-accelerated graphics and detecting mirror drivers, both intended as troubleshooting measures. It also fixes few minor typos in the translations and touches up various aspects of the user-interface, such as context-sensitive help through tool tips. This release updates Japanese translation and fixes a few others. No functional changes. This release adds checks for LUA engine to detect the most common (currently known) issue people are experiencing, and fixes a bug related to it. It also updates the Russian and Japanese localization. There is no public 2.8.1 release, because it was not stable. Updated sources to current state, no additional updates or harm involved. This release adds support for configurable "HKLM to HKCU" as well as the ability to specify the size of the client window using an actual window. It also fixes a bunch of UI and IPC issues, see the history for details. This release adds Spanish translation as well as increased space for help texts. It also adds the support for resetting client settings and data, and improves keyboard accessibility. Finally you can configure now, whether REG or LUA will be displayed first by default. This release properly implements Windows 8 support and improves error reporting and user-experience. This release updates Russian localization (new bits and few fixes). No functional changes. Since today's release was such a fail, let's do this again and better. This release fixes the display resolution list issue on Windows 8. Actually it's a lie, it does not fix it, but makes it work. It also makes sure, that the application does not run in the Windows Vista context on Windows 7/8. Cause for the empty resolution list issue on Windows 8 has been found and is actually quite simple. Windows 8 does not support any display bit-depth lower than 24 bits, because it considers them legacy and has to emulate them for applications it deems appropriate... Err What? This affects the official setup as well, since RO runs in 16-bit mode. Until there is a fix, setting compatibility to emulate Windows 7 or older will fix it. This release incorporates recently submitted translations and improvements to both localization and error messages. There are also certain changes that were supposed to be released as 2.6.2, after the source release (see history.txt for more details). Updated sources to the most recent state. If you intend to release your own builds, consult the license first. Regular binary release will follow in the next days. This release fixes an issue that rendered OpenSetup unusable on platforms that needed elevation. Windows 8 is still not considered compatible, as occasionally the display resolution list enumeration spits out 32-bit modes only, thus the list remains empty. RO OpenSetup has been tested for compatibility with OOBE Windows 8; result: failed, elevated transaction and resolution list do not work properly. Though elevated transaction seems to have stopped to work for Windows 7 as well, thus that might just be a careless bug. This release removes the need for administrator rights, except for saving changes. This should also solve save-failures when the setup is started by an underprivileged task (ex. game client or patcher). Saving will still fail as standard user on Windows NT/2000, as there is no secondary logon available. Also added an incomplete Japanese translation, while experimenting with the UI localization mechanics. This release fixes a careless mistake from yesterday, where switching the settings engine would not unlock fields specific to said engine. This release introduces localization of remaining parts of the UI, as well as two DirectX-related bug-fixes. There are no longer distinct Lua and registry releases, as both has been merged into a single application. The distinction is made at the icon in lower-left corner. While I actually wanted to release a maintenance release today, it ended up being a nightly only, since stuff did not work out like I wanted. Updated source or the SVN repository should be out before the end of the year... There are 3 milestones left, so two weeks each should be sufficient pace. I have stumbled upon various threads over the last months telling people to run OpenSetup or any other of my tools "as administrator" when they are experiencing problems. While this certainly fixes issues with a lot of software, it does not apply to my tools. They are UAC-aware, which means that they ask for elevation only when really necessary and otherwise do not need it. Running as administrator should not be considered a bug-fixing measure in general, especially not with software you do not know and use for the first time. That said, also avoid telling others to run something "as administrator" and ask them to report the issue instead. This release fixes a bunch of issues (see history.txt for more details), among others Lua-flavored OpenSetup's settings getting ignored by the kRO clients. Updating to this release is highly recommended for both REG and LUA flavors. There is currently one issue that can be experienced when using OpenSetup Lua with a kRO client that uses Lua for it's settings. All settings get read and written by OpenSetup correctly, but the client does not apply them and uses defaults instead. This issue is caused by the fact that OpenSetup does not unlock the settings by setting a certain key in the registry. Bugfix is in preparation and will be released within next days. This release adds Czech and (crude) Korean translation. This release adds Brazilian Portuguese translation and a few fixes (such as #150). This release introduces localized resources, for now with a German translation, but hopefully more languages in the future. It also fixes "Fullscreen" option not getting saved and adds support for "Trilinar Filtering" for the Lua build. Please note that a few clients, from the time Lua-based settings were introduced, are not able to read and/or update the settings (see history.txt for more details). This release fixes an issue where not all code pages would appear in ROExt's code page setting on systems that have more than 50 of them installed (thanks to #131). After getting asked (#113) and seeing, that the Lua-based setting saving is still being used, a new release will come. 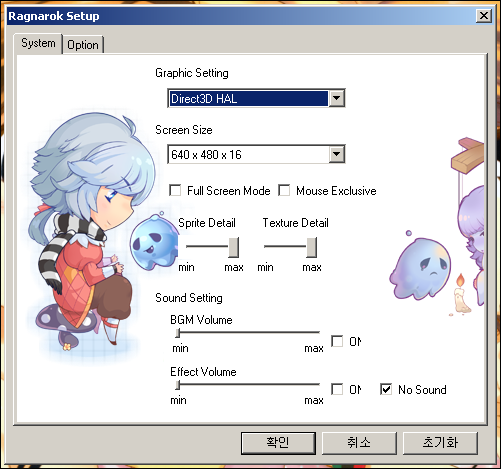 The registry-based setup also gets the options of the new official setup (system settings, options) where possible. Expected release is in about one or two weeks. As always you are free to give suggestions in the BBS. Merry Christmas. Where is it? Check the Q&A. After some insignificant fine-tuning, this can be considered stable version. Looks like I got bored again. Anyway, since there are major changes and some people seem to use it; this beta release changes the entire window layout and adds support for editing ROExt settings. If you do not know, what it is, either Google it or do not let it bother you; the settings are only shown, when the ROExt DLL is detected.